With a hotel in Wilmington, you get easy access to the beaches of North Carolina along with shopping, dining, and other attractions. There are accommodations to fit every mood, whether you prefer a quaint bed and breakfast, a high-end luxury hotel, or something familiar from a national hotel chain. Just consider the amenities that are the most important to you, such as a pool, being a beachfront property, free wireless internet, or complimentary breakfast. With your preferences in mind, there should be no problem selecting a hotel in Wilmington or the surrounding area to make your next vacation a time to remember. The hotel accommodations at Beau Rivage Golf & Resort have an old-fashioned charm. The clubhouse suites are spacious, with more than 700 square feet and the ability to sleep up to six people depending on the layout you choose. There is also a minifridge and wet bar, plus a separate bedroom. Other amenities include high-speed Wi-Fi and a private balcony or patio. Guests are welcome to make use of the golf course, one of the main activities on the property. The property also has an elevated range with targets in addition to the championship golf course, a 10,000-square-foot practice green, and chipping green with bumper. There is an Olympic-size swimming pool, a 65-foot poolside tiki bar, a fully stocked pro shop, and a business center. Get a meal at the Veranda Bar & Grill. The Graystone Inn dates back to 1905 and 1906 and was originally known as the Bridgers Mansion. This historic landmark is among the most elegant buildings in Wilmington and has had recent extensive renovations to bring back its turn-of-the-century grandeur. The rooms are luxurious, with down-alternative pillows, Egyptian cotton linens, European Matelasse coverlets, Gilchrist and Soames toiletries, and comfortable robes. Rooms also have irons, ironing boards, hairdryers, phones, TVs, and free wireless internet. The front desk staff will gladly offer concierge services, providing suggestions, making reservations, and more. Grab a daily newspaper from the parlor to stay informed. Common areas for relaxation include the dining room, the library, the sitting room, and the veranda. The beverage center is stocked 24 hours a day with complimentary beverages and snacks. Every evening, guests are welcome to attend the complimentary hors d’oeuvres and wine reception in the library by the fireplace. Guests can also buy wine and champagne by the bottle or the inn’s custom coffee blend by the bag. The daily breakfast includes the custom coffee blend, chilled juice, homemade pastries, yogurt, fruit, and full hot breakfasts that rotate daily. Alternatively, you can opt for the continental breakfast a bit earlier. With two days’ notice, the inn can accommodate dietary restrictions. Best Western Plus Coastline Inn The Best Western Plus Coastline Inn is along the riverfront, providing stunning views of the Cape Fear River in addition to offering Southern hospitality. The hotel is pet-friendly for a small fee and with advance notice. Suites feature microwaves, and all guest rooms have 39-inch flat-screen HDTVs with cable or satellite TV plus HBO, free local calls, high-speed wireless internet, hairdryers, coffeemakers, alarm clock radios, desks, irons, fridges, and extra in-room toiletries. For the convenience of guests, the hotel has wireless internet in all of the public areas and free use of a safety deposit box. Guests are welcome to use the exercise facility any time of the day without any extra fee. There are ice and vending machines as well as an ATM, and the front desk is staffed 24/7. Start off your day with a complimentary full breakfast, featuring coffee, juice, yogurt, hot items like eggs and breakfast meats, fruit, cereal, and a choice of bread. The C.W. 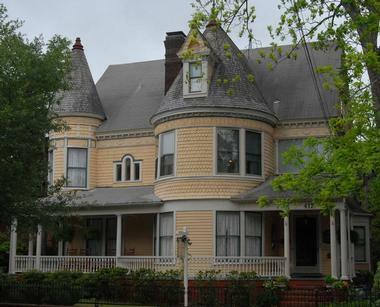 Worth House Bed and Breakfast is a 125-year-old mansion that has been hosting guests since being restored in 1985. The inn provides a casual, comfortable atmosphere with a traditional home-based setup for your bed and breakfast. 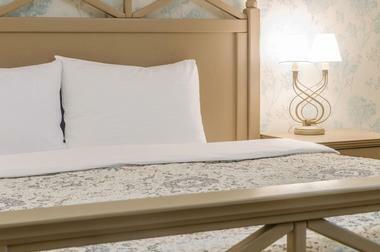 Each of the seven guestrooms is unique, with modern amenities and Victorian charm. Every room has its own private bath with a shower, with some also offering a claw foot tub and one featuring a two-person whirlpool tub. Other room amenities include decorative fireplaces, memory foam mattresses, 32-inch flat-panel TVs with DVD players, couch/sleeper sofas, antique wicker furniture, private sitting rooms, four-poster beds, and/or hand-painted ceilings. During your downtime, relax on the spacious Southern-style porch and enjoy the outdoors. Or just admire the property’s 19th century English Queen Anne architecture with distinctive dual turrets, porches, and bay windows. The room rates always include a full gourmet breakfast for two people. 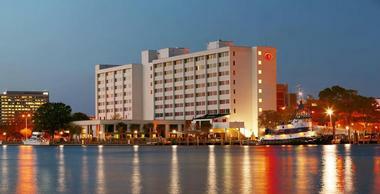 The Hotel Riverwalk delivers old-style service and comfort along with practical, modern conveniences. 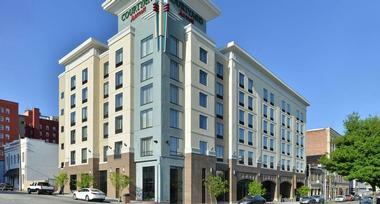 It delivers upscale yet affordable lodging in Wilmington. Rooms have flat-screen TVs along with new plush mattresses and beds. 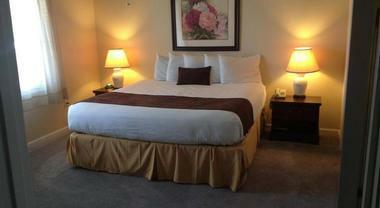 The eight guest rooms include six with king beds and two with queens. All rooms have individual climate control, built-in dresser drawers, closets, ceiling fans, phones with free local calls, ceiling fans, fridges, microwaves, irons, hairdryers, coffeemakers, soft towels, William Roam All-American toiletries, and private baths with showers and tubs. As you explore the property, admire the thick brick walls, large sweeping porches with plenty of spots to sit and relax, 11-foot ceilings, large windows, and abundant foliage. Relax in the guest lounge, by the granite lobby bar, or on the covered lobby patio. There is free on-site parking for guests. Every morning, stop by the complimentary Grab and Go Station to find a range of items that get your day started with plenty of energy. 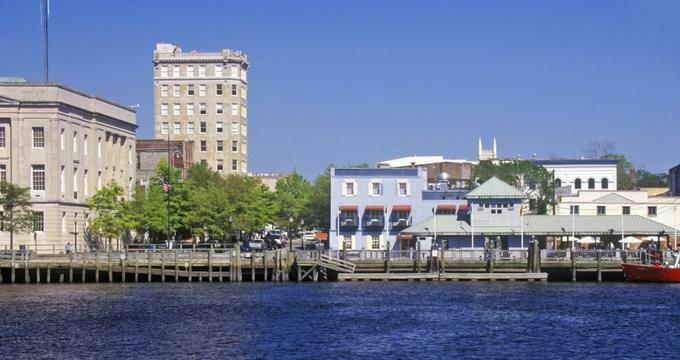 The Riverview Suites at Water Street Center is along the banks of Cape Fear River and right above the Riverwalk, providing elegance and easy access to attractions. 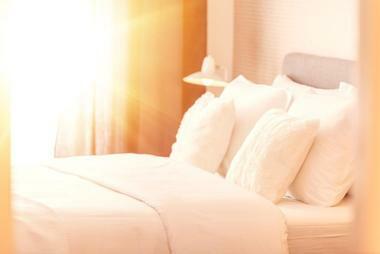 The suites are good for quick trips or extended stays, with their lounge areas, private balconies, and inviting décor. There is free wireless internet, so you can stay connected during your vacation. Other in-room amenities include washers, dryers, cable TVs, irons with ironing boards, sleeper sofas, fridges, microwaves, dining tables, separate bedrooms, coffeemakers, and luxury bedding along with amazing river views from the floor-to-ceiling windows. The complimentary shuttle takes guests to and from the airport. When on the property, relax at the outdoor pool just across the street while admiring the waterfront views. Additional amenities are split between this property and the sister property across the street, including a fitness center, a 24-hour business center, a gift shop, the concierge desk, dry cleaning service, wake-up calls, and an ATM. 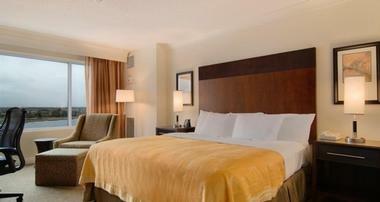 Hang out in the bar/lounge or enjoy breakfast at the nearby Hilton Wilmington. Stemmerman’s Inn is on the bank of the Cape Fear River right in the VonKampen Building within historic downtown Wilmington. The inn’s interior was renovated in 2008 and offers cozy, spacious, and charming suites. Every suite has a kitchenette, an upstairs sleeping loft, a large living area, and high ceilings. There are six in total, with your choice of a queen bed and queen sofa bed, two double beds, a king bed, or a king bed and pull-out sofa. Other in-room amenities include private bathrooms, hairdryers, irons, ironing boards, coffeemakers, Wi-Fi, cable TVs, wet bars, and microwaves. Guests get off-street parking so there is one less thing to worry about. Choose a room with a view of either the city or river, depending on your preference. 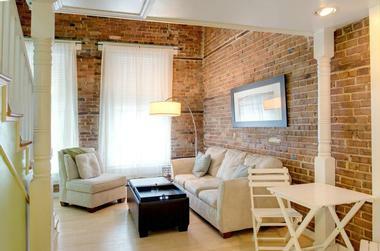 During your downtime, admire the building’s 1886 exposed brick as well as the beams. Sit on the common deck area above the parking, where you can people watch and admire the city. The inn is also in a prime location, within walking distance of dozens of things to see and do. 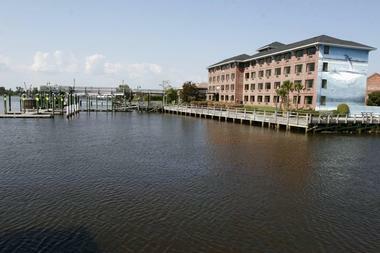 The Water Street Retreats provide easy access to shopping, the historic Riverwalk, dining, and more. 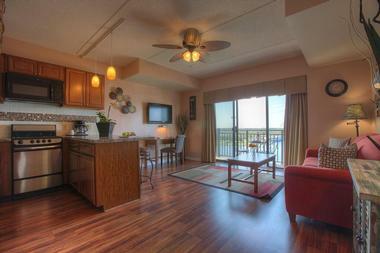 Every suite is designed to provide comfort, including expanded cable channels so you don’t miss a show. There are washers and dryers in every suite, so you can do laundry during your trip, plus a pull-out sofa ideal for the kids. There is also a full kitchen in every suite, including a fridge, microwave, and coffeemaker among other amenities. Lay down on the memory foam bed with its Egyptian cotton sheets and down comforter, or go to the living room and watch the 60 or 65-inch HDTV. Some suites also have balconies with amazing views. Just steps from the condos at Water Street Retreats, you will find cobble stone streets that are a century old and all the attractions Wilmington has to offer. The Front Street Inn provides guests with an inclusive experience at an award-winning boutique hotel that is also a bed and breakfast inn. All guest rooms are filled with light and are beautifully spacious. There is complimentary high-speed wireless internet for guests to enjoy. There are 12 rooms and suites to choose from, with amenities like hand-painted walls, claw foot tubs with showers, individual climate controls, large arched windows, maple floors, 14-foot ceilings, sleeper sofas, spa tubs, wet bars, fridges, two-person spa tubs, sitting areas, balconies, sectional sofas, overstuffed chairs, and/or gas fireplaces. There is on-site parking, so you will probably end up walking to all the nearby downtown attractions; the inn is just a block from the Riverwalk. The day begins with the complimentary full breakfast buffet, so you can choose exactly which items you want to eat. To complement your stay, consider an add-on like roses, chocolate strawberries and champagne, massages, and more. The Courtyard by Marriot Wilmington Downtown-Historic District is the newest of the Marriot hotels and was custom-built right in historic Wilmington. The property is chic with upscale amenities and modern design. 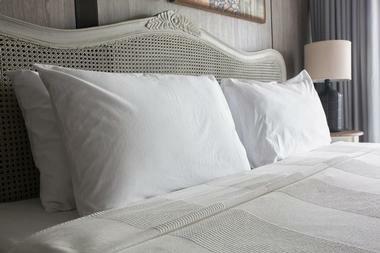 Choose from a guest room with a king and sofa bed, two queens, or a suite with a king and sofa bed. Guest rooms have coffee service, luxurious bedding, large desks with ergonomic chairs and conveniently placed outlets and lighting, mini-fridges, flat-screen TVs, air conditioning, Paul Mitchell bathroom amenities, alarm clocks, irons, phones with voicemail, radios, and iPod docks. Guests are welcome to take advantage of the free high-speed internet throughout the property or work up a sweat at the fitness center. Go for a swim in the outdoor pool to cool off after working out. The lobby is perfect for relaxation with its engaging technology and flexible spaces. Head to the bistro for healthy choices, a range of options for breakfast and dinner, specialty beverages featuring Starbucks coffee, and an evening bar. The Hampton Inn Downtown is a contemporary hotel conveniently located close to the Cape Fear Riverfront and the Wilmington Convention Center, along with other local attractions. Each guest room and suite has free wireless internet, a minifridge, and a microwave. Other standard amenities include LCD flat-screen TVs, fresh Hampton beds, coffeemakers, ironing boards and irons, and free in-room movie channels. Suites add sofa beds, microwaves, and under-counter fridges. Accessible rooms are also available. Take advantage of the business center, the 24-hour fitness center, or the indoor saltwater pool, depending on the activities you have planned. Take advantage of the complimentary printing service or the fax machine. Start the day with your free hot breakfast or opt for a Hampton On the Run Breakfast Bag for busy weekdays. All day, you will find free tea and coffee in the lobby. The Hilton Wilmington Riverside delivers an upscale experience right on the Cape Fear Riverfront, giving guests easy access to everything in downtown Wilmington, including dining, shopping, and nightlife. The rooms and entire property have complimentary wireless internet. Standard amenities include safes, adjustable thermostats, evening room service, Cuisinart coffeemakers, black-out curtains, alarm clocks featuring MP3 docking, Herman Miller Aeron Desk Chairs, executive work desks, 32-inch LCD HDTVs with premium cable channels, and complimentary high-speed internet. Suites offer even larger TVs and stylish living areas. The business center is open 24 hours a day, offering everything you need for a productive trip. You can get in a traditional workout in the hotel’s fitness center or go for a swim in the outdoor pool. For convenience, the hotel offers a complimentary shuttle to and from the Wilmington International Airport. Enjoy any meal you want at Ruth’s Chris Steak House or at Innovations, which serve seafood and steaks and classic American dishes with a twist, respectively. Or get a Starbucks beverage during the day or premium spirits, wine, and beer at Current’s Riverside Café in the evening. Head to the Snack Shop if you need a quick bite to hold you over while exploring. The structure housing Beacon House Inn Bed & Breakfast was originally built during the 1940s as a boarding house and is now a six-room bed and breakfast. The vintage dwelling has a homey, casual feel thanks to the warm knotty pine walls, but also has modern amenities. All inn rooms have luxury linens, Turkish Towel Company towels, beach towels, fine toiletries, fluffy bathrobes, and hairdryers. In addition to the rooms in the inn, there are three beach vacation cottages that are dog and family-friendly. They are set up for longer stays, with full kitchens. 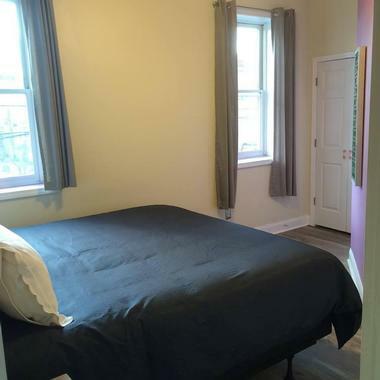 There is also the City Flat, which is also dog and family-friendly, in the center of historic downtown Wilmington. There is Wi-Fi for free throughout the property and cottages. The inn has mid-sized fridges on every floor, which are shared. They can provide sunscreen and beach towels and help rent beach umbrellas and chairs. You can schedule a massage or attend a yoga class. Start the day with an artisan breakfast prepared fresh or grab a cup of the inn’s gourmet coffee and enjoy it on the front porch, or both. All bed and breakfast guests get a sweet or savory breakfast, with the ability to accommodate dietary restrictions with advanced notice.